Let me start out by saying that, as father, I worry that my own kids are playing video games too much. As soon as I say that, I sound like an old fogey who wants to give them the boot out the door and say, “find some friends, don’t get into trouble and come back for lunch.” As a technology teacher, though, I see the value in some games (not all) and so I often have this conflict between parent and teacher in me. So I was intrigued by the article in Edutopia by Dr. Judith Willis, a neurologist, about gaming. In “A Neurologist Makes the Case for the Video Game,” Willis look s at the phenomenon from the perspective of the brain. She talks about the dopamine flow that comes from challenges and success, the adaptive skills that come from solving problems in games, and the incremental feedback (the progress bar) that drives players forward through intrinsic reinforcement. Willis then shifts her piece to the classroom, making connections with the merits of video gaming with establishing a system of learning. She notes that frequent check-ins, individualized goals and success, and reflective practice are all elements of gaming that could come into play (pun alert) in education. Does this mean we should rush to set up video games on all the computers in our classroom? No. But it does point again to re-thinking a natural response that “games are bad” and “that’s too much screentime.” Even so, I will be sending my kids outside today for a few hours. The sun is finally out, and they need the fresh air. Some things never change. 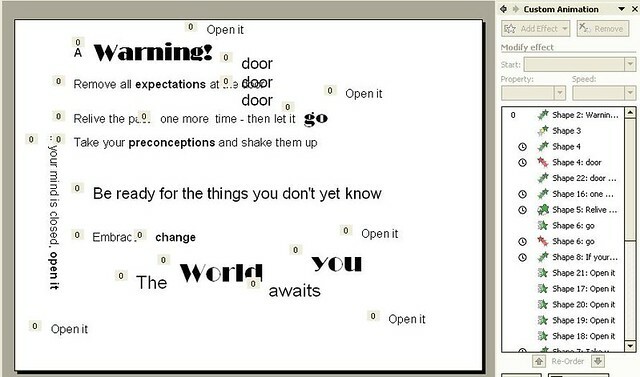 A Warning: An Illuminated Poem from Mr. Hodgson on Vimeo. I was asked by a few people yesterday how I created the illuminated poem I shared yesterday. So, I am trying to step back a bit and reflect on how I went about it and the choices I made in the composition process. A version of this post will also be on the National Writing Project’s Digital Is site. First of all, I began my day at Bud’s site, where he had an image of warning signs and a few lines of a prompt for a poem. I also had it in the back of my mind that I wanted to explore how to do a simplified Illuminated Text project. As I mentioned yesterday, it was through some colleagues at the National Writing Project’s Digital Is site that gave some insights, some inspiration and a direction for me to proceed into this unknown terrain. The writing came first, although I wrote the poem knowing that I would be using the text in some sort of animated project. I worried less about more poetic elements such as meter and rhyme and flow, and more about the message of the poem. The theme put forth by Bud was a warning, and I knew I wanted it to be about shaking up life to get to the things that are important. The lines came fairly easily, and I was revising them as I was creating the project. The last line was most important to me, and I changed it a few times to get it to how I wanted it. Next, I opened up Powerpoint. I’ve done lessons around animation with Powerpoint before with my students, although it has been some time since I dabbled in there myself. I decided to use a plain white background, and to use just one single slide. This narrowed my working space and limited some choices, but that was fine. I debated the black-text on white-background, and even tried some other colors. In the end, I liked the simplicity of the design. I wish I had more time to spend with font, though. I feel as if that area of text choice might be more deliberate than I was. I then slowly added each line of the poem as text boxes. Here, though, I made some decisions about which words should be separated from the line — which words should be their own individual block of text. The word “go” seemed to need to move, right? And I wanted to make the word “door” its own text, as if it were a doorway of sorts. The stacking idea came later, as the text became the door. I knew that later, these planned separation of text would give me more flexibility in the animation. I didn’t want too many words like this. Instead, I tried to break off pieces that had meaning on their own in the lines of the poem. Once the words were there, then I began the rather difficult task of animating the words and lines. There were about 20 pieces of animation in the poem, and synchronizing them to work one after another, or in tandem, took some time and trial-and-error. I wish I could say that I was very, very deliberate in every movement that I chose. For some lines, I was very purposeful. The line that ends “shake it up” was a line I wanted to shake up — connecting the visual to the words. For others, I wanted it only to look good. I’m not sure why I made one line vertical, and then added multiple “open it” texts around the piece. I had some vague concept of the phrase making connections with the poem. I don’t think it worked, even though it looks cool, visually (although I should have staggered it more). In fact, not every animation here is completely in sync with the meaning of the text it animates. More than once, I made some mistakes in the animation design and had to step back in time, and rework the sequence and flow. This is where the structural weakness of Powerpoint came into play — it is not designed for this kind of project, I concluded. The management overview of my workflow was weak. But I always like the idea of using a platform for something other than what it was designed for. I knew I wanted to convert the Powerpoint into a video, and I have this software program that I bought a few years ago to do that. But I guess I hadn’t updated it recently, and it would only create a video with a watermark. I didn’t want that, and so I turned to the web. I found the AuthorStream site, which converts slides to video and then kicks out an embed code and hyperlink. I wasn’t happy, to be honest, because I didn’t want to the poem to be silent. But I could not find a way to add audio with the site. Later in the day, I finally figured out how to update my Powerpoint conversion software. I took that raw video, and dumped it into MovieMaker, where I added some music from Freeplay Music. Then, I added in a narration audio track, which is what I wanted all along. I want voice in my poems. The result is pretty decent, and I could not host it myself at my Vimeo video site, which I am now doing. Given the limits of the tools I used, I am pretty happy with the results. I think the technology helped make the poem very different than I would have been as just lines on the page. The animation, and the choice of words that get animated, and the sequencing of animation — plus the audio tracks — really make this a very different kind of poem. Could I replicate this in the classroom? Yes. It would require time and mini-lessons around the deeper levels of Powerpoint — particularly around structuring a page of animated text (which requires organizational skills) — but on a smaller scale, this is doable. And there is no real need for the conversion to video, either. You can add audio right into Powerpoint slides and share the project out as a PP Show. The quality is not as good, in my experience, but it is workable. For a while now, I have been interested in the idea of “illuminated text” and how to create a project that uses this concept. Over at the NWP Digital Is site, Elyse has been offering suggestions on how one might proceed. She suggested Powerpoint might be one cheap option (and gave a link to a site with various projects that might be models), and a light went off in my head. Of course! So it is a silent poem. And here is a screenshot of my Powerpoint, just to give an idea of the complexity of animation. Still, I think this could be done with students, on a smaller scale. I’m not going to say that all of the poems are very good. A few are just a possible start towards something else. A few are written, posted and then discarded (recycled?). Here, then, are a few poems from the last two weeks that I think have some legs. First, Lisa posted a call for poems about teaching on Twitter and her blog site, and I wrote this one not long after our standardized testing. I call it “The Muted Mind” because I was trying to get inside the head of a particular student. Second, in the iAnthology, I was having a discussion with someone about ee cummings and the off-beat style of poetry. 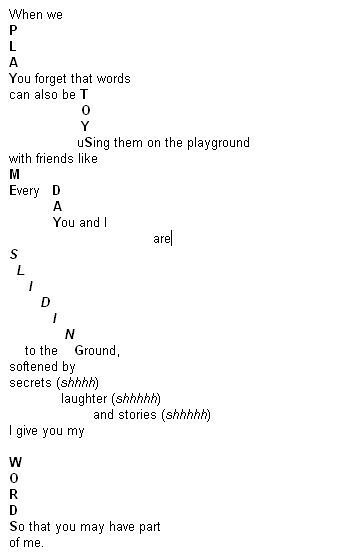 When Bud posted an image about “play,” I decided to play with a poem myself. This is a haiku that I wrote on the first day of April, hoping for warmer days. One day, Bud posted an image of the Periodic Table of Elements. Here is what I came up. uncover the magic of that. Also on the iAnthology, a weekly writing prompt asked us to the concept of Hate with metaphor. This was difficult and I had trouble finding a way in. I decided to use Prezi again, and center my ideas around a giant version of the word Hate, and then end with a positive message. And finally, this poem is inspired by the circular nature of math — a sort of poem that folks in on itself. It’s a Mobius Strip of words. What poems are you writing? 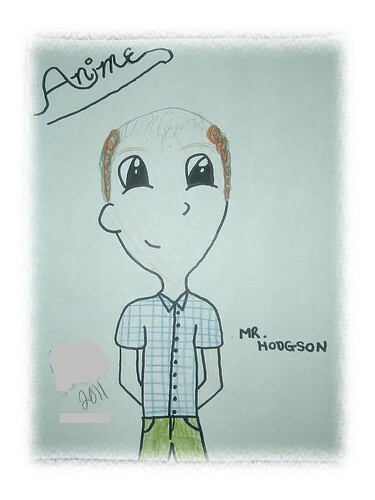 One of my students drew Anime versions of her four sixth grade teachers for their sixth grade yearbook. This one is of me. She did a great job, don’t you think? To be honest, I thought Google Video had long ago gone away and become part of YouTube, so I was surprised yesterday to get an email from Google, letting me know that “Later this month, hosted video content on Google Video will no longer be available for playback.” A few years ago, we could no longer upload videos into Google Video and now playback is packing its doors. For many years, I loved Google Video. It provided me with a relatively safe place to upload and share videos, and then embed them, with very little worries about students clicking back to an inappopriate site. I do remember when Google bought Youtube, and I figured, that would be it for Google Video. It took longer than I expected, but long ago, I made the shift over to Vimeo (which gives me much more flexibility on embedding, although I pay an annual fee). Google is allowing us to download any videos from Google Video. By the end of the month, the videos will be gone and the site will disappear from the video landscape. As I was looking over the nearly 100 videos that I still have on Google Video, I had some nostalgia flashes around various projects during that time period, which began for me in 2006. I was just learning about video and about hosting video, and it was all experimental for me (maybe it still is). Three of the videos are claymation stories that my three boys and I made here at home, as I was toying with how to bring stopmotion into the classroom. The stories were written by my oldest son and the movies were a collaborative venture by the family. There was a newsletter email in my box the other day from National Writing Project Executive Director Sharon Washington that began with the line that “We would like to share some good news.” I wondered, is this it? Has funding for the National Writing Project somehow been restored? Has all the lobbying in DC and the hundreds of blog posts and all of those phone calls finally made a bit of a difference? Funding is still gone in the latest budget and the “good news” is only that NWP and all of the other literacy groups that got stripped of federal support can now apply for some competitive grants, which the government has “graciously” set aside from its $3 billion in teacher-quality testing money for educational programs. That amount is apparently just one percent of the $3 billion. I know we are in the era of competitive spirit (ie, Race to the Top) as a push to enact positive change in struggling schools. It’s an era where “my” program has to beat “your” program in order to keep afloat from year to year. Survival requires lobbying, and political connections, and is anchored on other things that we classroom teachers don’t always “see” because we are too busy working on lesson plans, giving an extra hand to the struggling student or teaching, for goodness sake. But I do wonder if the officials who set up these competitive elements realize that it may very well be our students — the most vulnerable population out there — who are most impacted. I look at the list of educational programs that are cut and I can’t help but think: so many of these initiatives are reaching under-served populations of students and struggling socio-economic communities, and now they are gone or in danger of disappearing. Which means, the cuts are continuing. Brace yourself. My job as the teacher, and coach, is to keep my students positive (even if we lose), foster good collaboration and communication amongst our class, remind them of the balance between wanting to win and being a gracious loser, and working hard. Some years, that is all harder than others. Not this year. Not with this class. They have been wonderful — supporting each other, very little complaining, coming together as a single team instead of 21 individual students. I can’t say it is all roses. One student is missing a substantial part of the day because of consistent behavior difficulties. We’ve tried to work with this student all year, but impulsiveness is their downfall right now, despite multiple warnings and smaller consequences other than losing Quidditch. Which is too bad. For a student like this one, Quidditch is the kind of event they can thrive and excel at. But in the end, logical consequences had to come into play. 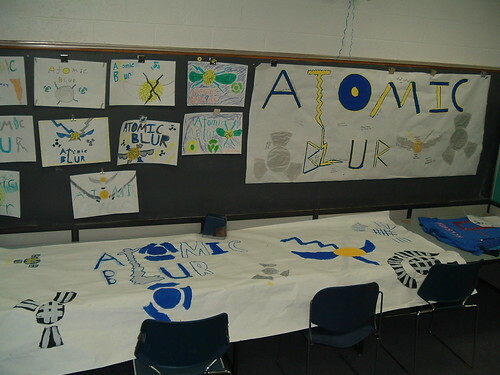 Our team name is Atomic Blur and as you can see by the picture, they have been working hard at developing posters that now hang in the gym for today’s events. We’re the blue team. Yesterday, my class chose a theme song for the team. Appropriately enough, it by the band Blur. The song — Song 2 — will be playing when they enter the gym for each of the games. Whoohoo …. Wish us luck. We’re going to have noisy, chaotic fun today. We often “write into the day” to get our thoughts together. 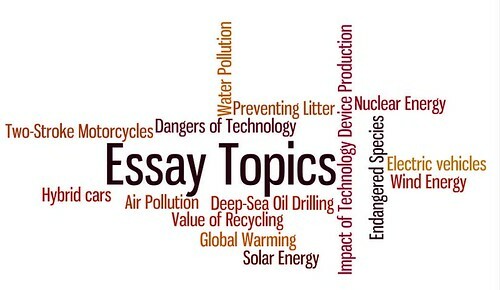 Yesterday, I had my students write an overview of the topic that will be the heart of their Environmental Science/Persuasive Essay project now slowly getting underway. (See some of the various topics they have chosen to write about in the Wordle above). What is your topic and why did you choose it? What is your opinionated “stance” on the topic? What are some interesting facts you have discovered to help make your case? What would an argument be AGAINST your essay’s topic? As you might imagine with sixth graders, this last question stumped a lot of them. Who wouldn’t be against air pollution? Who wouldn’t want to save that little furry animal? We’re on vacation next week, and we play our huge Quidditch Tournament tomorrow (yikes! ), so the next step here is use the Essay Map Graphic Organizer and sketch out some main ideas. Then, we put the project off to the side until we return from vacation. By the way, I compiled some various science links and resources that they were using to do some basic inquiry around their topics. Yesterday, I shared some of the handout materials that we are using for our Environmental Science/Persuasive Essay Project that my sixth graders are starting to embark upon. As we began some web-based research yesterday, I explained to them that I was assigning myself the project, too. And I am. As they work through their ideas, I am working through mine. My intent is to make my thinking visible to them every step of the way — from these initial brainstorming/planning sessions to the writing of the piece to the creation of the media component that will accompany the essay at the end. I want to try to show them how writers work — the ups and the downs — and answer questions they have about my writing process, and share my work with them, just as I have them share their work with me and the class. 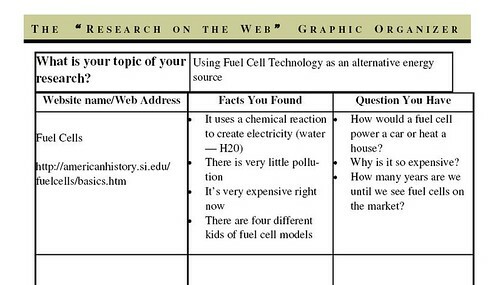 So, yesterday, I shared out my topic (Fuel Cell Technology as an alternative energy source) and walked them through how to use our graphic organizer on gathering information from websites. Although it is not a full-scale research project, they need to have some background knowledge in order to “make a case” for their persuasive ideas. Tomorrow, we will begin to use another graphic organizer to map out their essay. For many of them, this is the first large essay project they have encountered, and so we take it slowly, laying out daily expectations to make it manageable. A graphic organizer is invaluable to this project for many of my students, particularly those struggling writers. Writing with my students is a powerful experience, and I wish more teachers would do it. I can’t remember any of my teachers actually writing with us or sharing their writing with us. It always made me wonder what kind of writers they were. It was as part of them was hidden from view. My students appreciate the honesty (I tell them when I run into walls and I let them in on frustrations and successes), and I hope it provides a model for them in their own writing. The real dangers here are that you could embarrass yourself as a writer (I don’t worry about that but I acknowledge that some teachers do) and some students might seek to emulate you so completely that it feels as if they are a shadow writer. That’s why I picked Fuel Cells — not a single student knew what that was and there was no danger of a copycat writer. (Oh, another bonus: I get to learn more about an interesting alternative technology and my students will be learning, too, through my sharing of my work).